Astronaut Alan Poindexter works on the aft flight deck of space shuttle Atlantis during his first spaceflight in 2008. Former astronaut Alan "Dex" Poindexter, 50, a space shuttle commander who flew twice into space, died Sunday (July 1) after being injured in a water sports accident in Florida, NASA has confirmed. "The NASA family was sad to learn of the passing of our former friend, and colleague Alan Poindexter who was killed today during a jet ski accident in Florida," the space agency wrote on Facebook late on Sunday evening. "Our thought and hearts are with his family." According to local media reports citing the Florida Fish and Wildlife Commission (FWC), Poindexter was jet skiing with his two sons near Little Sabine Bay off of Pensacola Beach, Fla., when the accident occurred. "Poindexter and his 21-year-old son were on one jet ski and his oldest son was on another jet ski. Poindexter was sitting still in the water when his [older] son's jet ski came barreling into him," the local ABC affiliate WEAR reported, citing the FWC, which investigates boating accidents. Poindexter was rushed to Baptist Hospital in Pensacola, where he later died from his injuries. A portrait of NASA astronaut Alan G. Poindexter, veteran space shuttle pilot and commander. "He was a talented, courageous Navy veteran with gifts," fellow astronaut classmate Gregory H. Johnson wrote on Twitter. "Dex was a lovable guy with a strong work ethic." Named as an astronaut in 1998, Alan Poindexter was a veteran of two spaceflights. 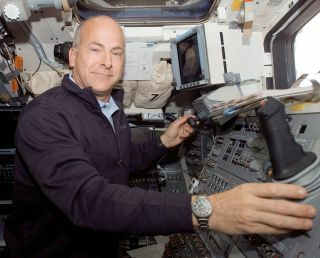 In February 2008, he flew as pilot on the space shuttle Atlantis' STS-122 mission to deliver and install the European Space Agency's Columbus laboratory for the International Space Station. In total, Poindexter logged 27 days and 21 hours in space over the course of his two missions. The STS-122 mission crew members stride out of the Operations and Checkout Building at NASA's Kennedy Space Center, eager to ride to the launch pad and take their seats in space shuttle Atlantis for the planned launch at 2:45 p.m. EST. Seen on the right, front to back, are Commander Steve Frick and Mission Specialists Rex Walheim and Hans Schlegel. On the left, front to back, are Pilot Alan Poindexter, followed by Mission Specialists Leland Melvin, Stanley Love and Leopold Eyharts. Schlegel and Eyharts represent the European Space Agency. Before flying in space, Poindexter served in the Astronaut Office shuttle operations branch as the lead support for activities at the Kennedy Space Center in Florida. He later served in Mission Control as a spacecraft communicator, or Capcom, for several missions, including STS-125, the final flight to service the Hubble Space Telescope. "Dex was a well-respected leader within our office," Peggy Whitson, chief of the Astronaut Office at NASA's Johnson Space Center in Houston, said in 2010, when Poindexter announced his retirement from the space agency. A U.S. Navy captain with more than 4,000 hours in more than 30 different aircraft types, including more than 450 aircraft carrier landings, Poindexter left NASA in 2010 to return to his alma mater, the Naval Postgraduate School (NPS) in Monterey, Calif. Poindexter was still serving there as dean of students and executive director of programs at the time of his death. Alan Goodwin Poindexter was born on Nov. 5, 1961, in Pasadena, Calif., but considered Rockville, Md. to be his hometown, according to his NASA biography. He earned his bachelor's in aerospace engineering in 1986 from the Georgia Institute of Technology, and a master of science in aeronautical engineering from the Naval Postgraduate School in 1995. He was designated a Naval Aviator in 1988 and made two deployments to the Arabian Gulf during Operations Desert Storm and Southern Watch. Poindexter was serving as a department head for Fighter Squadron 32 at the Naval Air Station Oceana, Va., when he was recruited by NASA. Poindexter is survived by his wife Lisa and their two grown sons.